How Can Investors Get a Euro 1 Contract in Albania? Recently, the interest of companies and businesses in signing symbolic Euro 1 contracts has increased significantly. Minister of Economic Development, Tourism, Trade and Entrepreneurship Milva Ekonomi explained in an interview for Scan TV details about the current situation and the perspective of Euro 1 contracts. Thank you, Minister, for your time and for speaking about one of the issues that have been largely mentioned, the Euro 1 contract. You know what businesses have achieved through these contracts and what’s the interest of investors in this type of contract? As a matter of fact, Euro 1 contract was first applied in 2010 and the first company that won this contract was Kurum International. So far, 23 contracts with the symbolical value of Euro 1 have been signed. Meanwhile, some four contracts are in the process and four businesses have shown interest in them. Those that acquire a Euro 1 contract must submit a business plan, which has details on the value of the investment and the number of people that they plan to hire, to the Ministry of Economy. The companies that apply for these contracts participate in a race. If their investment and business plans are well-founded the contract is signed. However, continuous monitoring is needed. Hence, the Ministry takes the responsibility to monitor these contracts in order to tell if the companies have implemented the contract and hired the number of people that they declare in the business plan. This is a measure of the agreement included in the contract. Further on, an analysis of the situation of these contracts is held once a year. So far, these companies brought investments with a value of Euro 25 million and over 3,410 persons are working for them. They have rented state-owned facilities and 13 of them invested in the footwear and apparel industry while ten others operate in the producing sector. They produce materials made of wood or concrete. This is the current situation with Euro 1 contracts. Our main duty is to inform businesses about these facilitating initiatives. On their part, they must comply with all the applicable laws. Based on the data collected by the hitherto contracts are you satisfied by the performance of investors? To this day we are satisfied. Support was unlimited and in order to ease the process, we have applied a decision adopted by the Council of Ministers. Cooperation with businesses is done based on this decision. It allows businesses to declare a possible difficulty and require for a solution to any specific problem within the legal framework. What are the Ministry’s ways for promoting Euro 1 contracts? There are some ways for getting information about them. We have drafted a list on 60 state properties and uploaded it on the Ministry’s website. Moreover, we have a list of 1,500 properties and assets that also can be accessed on the website. Moreover, we have used another mechanism which helps to bring businesses closer to the state asset, which will serve to further develop or bring new ideas or initiatives of the enterprise. This instrument is a new website that is currently developed by the Albanian Investment Development Agency (AIDA). This is about 100 assets both from the public or private sector in the case when physical or juridical persons own a property that they want to develop. 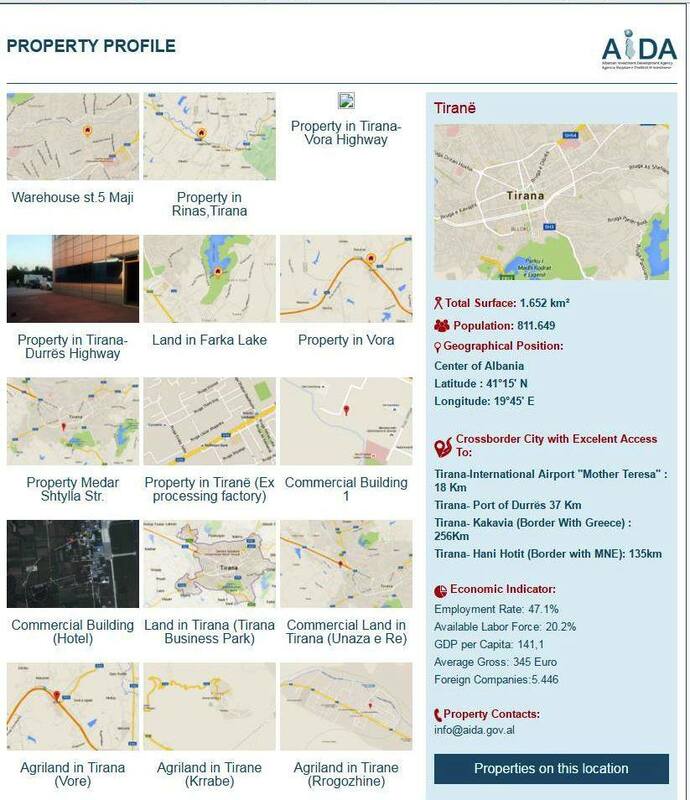 Each of the properties has a profile, which provides detailed information and photographs of the asset. Thus we are using all the possible ways for encouraging investors that plan to implement their business ideas in Albania. On the other hand, there is the initiative of economic and technologic areas TEDA. There is a website for TEDA about the race on Spitalla and Koplik areas. What about the business plans submits by investors? Do they have all the necessary information? This is a good question. Ongoing trainings are held by AIDA and the Ministry the instruct investors and companies on the way to draft a business plan. Even when the plan is submitted, the business has the right to ask questions and get answers by the General Directorate of Public Property. Obviously, there are some basic data that are provided to the company in the moment when the investor requires developing a property. Speaking of legal consultancy, they get it privately or by the Ministry or AIDA? AIDA, the Ministry and the National Business Centre provide all the legal consultancy. The legal frame that we implement is complete and we are going to improve it if it will be considered necessary. All the people and investors interested in these objects can find them here.